A Texas-based developer plans to build 1,000 condominiums near the site of the proposed Twins ballpark in downtown Minneapolis. If the ballpark isn't built, they propose 3,000 units. The warehouse district, located a few blocks from the stadium site, is already awash with new condominium construction and renovation. But some say demand for the housing -- ranging in price from $150,000 to a few million dollars -- is strong and showing no signs of slowing down. Minneapolis, Minn. — Thousands of condos and lofts have been built in the warehouse district over the last several years. Some of those units are located in brand new buildings. Others are in renovated warehouses like the Bookmen Lofts. "There are 57 units here, underground parking, there's a wonderful fitness center," says John Beal, a real estate agent with Coldwell Banker Burnet. Beal sells condos in Bookmen Lofts and in Bookmen Stacks, a new nine-story tower under construction next door. The buildings are just a few blocks from both the proposed Twins stadium site and where the Northstar commuter rail and Hiawatha light rail line are planned to meet. In the loft building, the condominium includes high ceilings, track lighting, stainless steel kitchen appliances and plenty of windows. It sells for just over a half a million dollars. Prices in this building start at just under $450,000 -- an average of about $400 to $500 per square foot of space. All but four of the 57 units in this building are sold. Beal says it's the supply of downtown housing that is creating such a demand. "The more people who live downtown, the more downtown becomes attractive as a market," Beal says. "And years ago -- I've been downtown for 18 years -- some people took it seriously, but many people didn't. Well now, with as much housing and ancillary services that go with it, that there are in downtown Minneapolis, it is the hottest market in the city." Just down the street from the Bookmen Buildings are the 710 Lofts, 720 Lofts and pretty soon, the 730 Lofts condominiums. 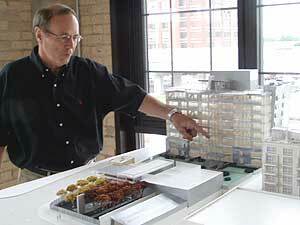 Fritz Kroll, an agent with Edina Realty who is selling units in the new buildings, says they are selling very well. Kroll says he's also working with developers on another building that is already almost full. He says the market is not oversaturated. "If that was the case, I think we'd see developers stopping," says Kroll. "Because I don't think there are many, if any, developers who want to pursue projects just to lose money." Kroll is also a resident of downtown Minneapolis, and a member of the neighborhood association that serves the warehouse district. He says lately, a majority of prospective buyers -- especially those in their 20s and 30s -- are attracted to the idea of living near a major league baseball stadium. "The buyers that are most excited about the ballpark tend to be those who've moved from Denver or Chicago or Boston, and have very fond memories of living in a neighborhood near a ballpark," says Kroll. "They are the ones who are most anxious to have that come into the neighborhood." Some say the jury is still out about what impact the proposed Twins stadium may have on the area. "I think that's hard to tell," says Mary Bujold, president of Maxfield Research. The company conducts market research for clients that include real estate firms and city governments. "There are some people, of course, who are very excited about a Twins stadium," Bujold says. "And I think that would appeal to a certain group of people. And to others they might see the stadium as more of a nuisance." The new development proposed by Hines International includes lower priced housing -- less than $300,000. Bujold says that will likely draw a younger demographic. She says the market should be able to handle the additional housing if the developers are cautious. "I think maybe 10 years for 3,000 condos might be a little aggressive," says Bujold. "But I think as long as the development is spaced out, and it's done with the intention of monitoring absorption as the units are developed -- yeah, I think it can handle that many units." Of course the Twins stadium funding deal is still up in the air. State legislators have to approve Hennepin County's request to raise its sales tax rate in order to fund the ballpark.